Filled with excitement, dreams and compassion for the natural resources; a collaborative partnership for the promotion of public awareness of the values of biodiversity and the actions that people can take to conserve it, between ABS-CBN Lingod Kapamilya Foundation, Inc. (ALKFI),. and Asean Centre for Biodiversity (ACB) was successfully held on August 18, 2015. This partnership strengthens and widens the consciousness of the public on the importance of biodiversity conservation and the role of everyone. Under the partnership, the two organizations will also provide learning opportunities to media organizations on how to provide deeper and more insightful coverage of environmental issues. With Bantay Kalikasan’s partnership with ASEAN Center for Biodiversity, its advocacies and experiences can be shared at the regional level. ACB produces studies and policy advocacy materials that are made available for the international audience which includes decision makers. 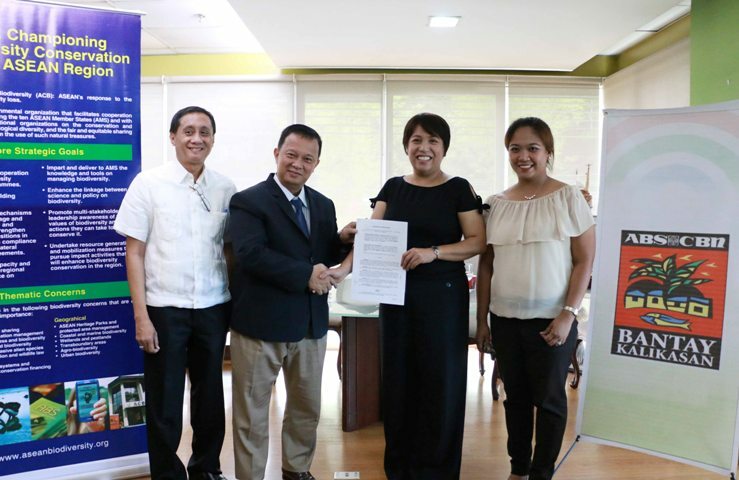 With the one-year partnership, ACB and Bantay Kalikasan will focus on sharing of success stories, collaboration on forums of biodiversity, production and dissemination of communication, education and public awareness (CEPA) materials and joint initiatives on biodiversity conservation and advocacy. ASEAN Centre for Biodiversity is an intergovernmental regional center of excellence on conservation and sustainable use of biological diversity and the fair and equitable sharing of benefits arising from the use of such natural resources.